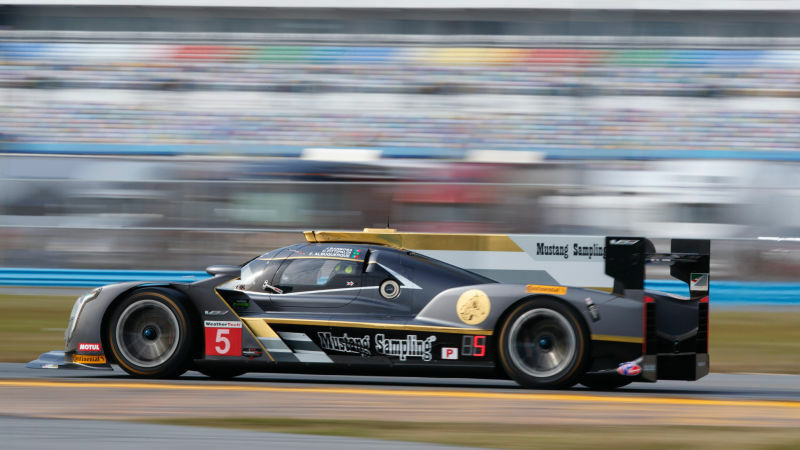 Cadillacs finished first and second outright in the Rolex 24 Hours of Daytona this weekend. The result marks the third win in Florida for Cadillac, but this one was 'heart in the mouth' stuff as the leading car battled overheating issues in the final hours. During the last few laps the team instructed drivers to shut the engine down on the straights to help cooling! Keep in mind, these long distance races are run like a sprint - for 24 hours, so the pace never lets up. The Cadillac race car uses Cadillac's 5.5L V8, in a Dallara chassis. Many cars suffered punctures from track debris and about six hours into the race, teams had to second guess the weather as steady rain began falling. You don't realise just how hard it is, unless you stay awake and follow the race for the whole 24 hours - as I have done, both at Le Mans and Daytona. However, it's the last 15 minutes that are usually the hardest to deal with. Postscript: The sponsor of the winning Cadillac DPi, Mustang Sampling, is a company which provides highly accurate analysis of gas samples for the natural gas industry. I'm not sure how many of its clients were glued to the TV screen for 24 hours? But the company must figure there's a value-for-money benefit from the exposure. Maybe! I'm not convinced. Now I know you take whatever sponsorship you can get, but a company called Mustang Sampling on the Caddie - am I missing something?